You may or may not be aware that there are lots of items in the game that seem worthless when you see one drop, and most likely sell them to a vendor or disenchant them. 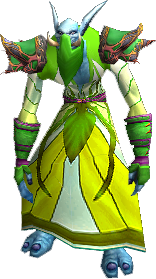 Here's one of the low level sets that are relatively easy to find, at least from the auction house and has been selling nicely since transmogrification was implemented, the Venomshroud Regalia. Where to farm Venomshroud Masks? Like all greenies, these too are world drop items. That means you cannot farm them. All level 44-55 monsters have a very small chance of dropping one of the following. They are worthless, except for transmogrification purposes. For example, the headpiece alone has been selling for anywhere between 500-9000 gold according to reports. But then again, it's the lone item that most people are after from the set. Other pieces from the set are less expensive, especially if they have low visibility, like the bracers. I'd still keep the price at even 500 gold a piece for each of them, besides bracers. Remember: Mostly rich people are interested in transmogging, so you can keep the price tag high! If you don't want to run level 50 instances over and over again in hopes for greenies, your best bet is to visit the auction house regularly and search for "Venomshroud". If you see any items, especially the Mask selling for less than 200 gold, it's a good idea to flip them! If you still want to farm them by killing things, click on a item from the list and sort them by Count so you can see which mobs have been dropping the most of them.